May 20th,1875. Meter convention has been signed by the representatives of 17 countries. The metric system became obligatory. November 15th, 1888. The First Law of Weights and Measures was adopted by the 5th Ordinary National Assembly. The new weights and measurements units had been introduced together with their derivatives: main unit – meter; surface unit – square meter and its multiples, measure of capacity – liter and weight – kilogram. February 8th, 1910. The Fourteenth Ordinary National Assembly adopted the Second Law of Weights and Measures. The nomenclature of quantities and it’s units had been enlarged with the units of temperature, density, force, pressure, work, electricity. Bulgarian prototypes of meter and kilogram had been approved. Bulgarian Metrology Service had been developed officially. November 5th, 1948. The Grand National Assembly adopted the Third Law of Weights and Measuring Instruments. Legal measurement units and it’s samples were approved. The membership of Bulgaria in Bureau International des Poids et Mesures, BIPM, was legitimate. The internal control of measuring instruments was regulated. Internal metrological services had been developed. April 9th, 1998. 38th National Assembly adopted the Fourth Law on Measurements. The examination of measuring instruments had been democratized by this new law. According to it eligible on obligatory metrological control are only those measuring instruments, used in particularly important for the country areas such as health care, safety at work, radiation, nuclear, transport and fire safety as well as environmental and defense. The other measurement instruments are subject of internal control and calibration. - Bulgarian Institute of Metrology with its Directorate General “National Center of Metrology” (DG NCM) and Directorate General "Measures and Measuring Instruments" (DG "MMI"). - State Agency for Metrological and Technical Surveillance (SAMTS). What type organization is the Union of Metrologists in Bulgaria (UMB)? The Union of Metrologists in Bulgaria is a non-profit organization. - production, repair, exploitation of equipment, used in measurements, testing and calibration. UMB is a non-profit private association by virtue of the Law on non-profit legal entities and it performs its activities in favour of its members. UMB is a successor and continuator of the professional traditions of the Central Office of Quality established in 1969, section “Metrology” and section “Testing”. UMB was constituted on 1st November 1990 in the town of Varna. The UMB was re-registered on 7th November 2001 in relation to the adoption of the Law on non-profit legal entities. What are the objectives of UMB? - To contribute to the building-up of specific and permanent knowledge, awareness and attitude to their practical application. What are the activities of UMB? UMB performs its activities respecting the Constitution of the Republic of Bulgaria, the national legislation and the Statutes of UMB. 1. Examines and disseminates scientific and technical knowledge, national and international achievements, and experience by publications, organization of symposia, conferences, seminars, discussions, courses, exhibitions and other scientific-technical and informational events at national and regional level with or without international participation. 2. Expands its contacts and cooperation with governmental institutions, organizations, companies, laboratories, institutes and non-profit organizations related to the activities in the field of metrology, standardization, certification, accreditation and quality management. 3. Contributes, participates and expresses positions in the process of development, implementation and improvement of projects, programs, normative documents, written standards, methodological, technical and other documents. 4. Performs educative, training, consultant and other propaganda activities and provides conditions for free creative-professional contribution of its members. 5. Facilitates the professional contacts and interactions between its members in the country as well as those with similar organizations abroad, assists group and personal interests and creative contributions. 6. Organizes and assists the metrology specialists in their training, qualification and re-qualification. 7. Participates in ensuring the protection of the creative - professional interests of its members. 8. Represents its members to governmental institutions, non- governmental organizations and legal entities in relation to its activities in the country and abroad. Who are the partners of UMB? UMB is a regular member of the Federation of Scientific and Technical Unions in Bulgaria. 3.International organizations such as IMEKO (International Measurement Confederation), EURACHEM (European organization for cooperation in chemical measurements) and others institutions in similar fields. UMB is a member of IMEKO and takes part in Technical Committees. 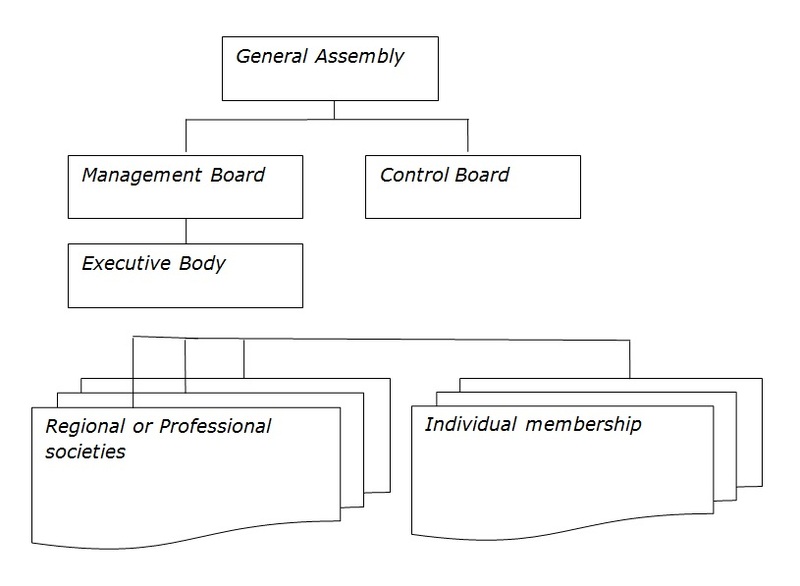 What is the structure of UMB and what are the Management and Control Bodies of UMB? The basic structural unit of UBM is the society. The supreme body of UBM is its General Assembly, which elects the Management Board, the Control Board and the UBM President. The Management Board elects Executive Body. UMB is managed and represented by a President who is responsible for the implementation of the General Assembly decisions. The President is assisted by Vice-Presidents. The organization and coordination of the work as well as the implementation of the decisions of the Management Board and the Executive Body are carried out by the UBM secretary. UMB approved as its professional day the Day of Metrology – 20th May. Once per two years UBM organizes, in cooperation with the Bulgarian Institute of Metrology and the State Agency for Metrological and Technical Surveillance a scientific-practical conference with international participation "Metrology". The conference is held in the town of Veliko Turnovo where in 1888 the first Law on weights and measures was adopted, as well as in other cities in the country. UMB participates as co-organizer in the annual scientific symposium with international participation "Metrology and Metrological Assurance", organized by the Technical University - Sofia. UMB carries out educative and training activities by organizing courses and seminars on important and current topics in the field of metrology. The programs and topics of the events are discussed and approved by a Program Committee. UBM has implemented a criteria system for lecturer’s selection and level evaluation of the organized events. UMB organizes travelling seminars in the country and abroad as well, aimed at visiting locations and organizations with significant importance for the metrological activities. UMB respects strict requirements and works in a partnership with the governmental authorities and non-governmental organizations and professional associations in order to provide its members and interested parties with current topics presented by highly qualified lecturers. Every year UMB prepares and carries out Training Program, which is published on the website of UMB. Main directions of training are: general and basic questions of measurements (such as metrological traceability, processing of measurement results, uncertainty, calibration, management of measuring equipment, legal metrology requirements, etc. ), Training courses in different fields of measurements, training courses of quality management in metrological laboratories, organizations and control bodies (according to BDS EN ISO/IEC 17025, BDS EN ISO 19011, BDS EN ISO/IEC 17020), good laboratory practices etc. Parts of the courses are built on a modular principle. Since 1998 UMB has been carrying out its own publishing activities that, according to some enquiries performed, meet a great interest among the members of the union and the interested persons. UMB issues yearly several bulletins where normative documents, translations of international documents and written standards, publications and translations in the field of metrology are published. In 2004, in order to accomplish its goals, UMB established and accepted rules for bestowing Award for the best diploma thesis in the field of metrology. The Award is a distinction of UMB, which is given to students - bachelors and masters from all universities in the country, for the best diploma thesis on metrological subject where the results obtained have scientific and/or practical contribution. The competitions are announced in public by 1st of May of the current year. The Award is bestowed in two educative degrees: Bachelor and Master. Two awards are bestowed in each educative degree: for first place and for second place. The graduates - winners of the Award receive individual charter certifying the bestowing of the Award.